Editors Note: Have you ever wondered who controls the corporate mainstream media? Well there is just six companies that control 90% of what you read, watch, and listen to. The mainstream media desperately does not want you to look at “the men behind the curtain”. They just want you to stay plugged into the “programming” that they are feeding you without asking any questions. Here is a quote that sums up the controlled corporate media perfectly. This quote is by John Swinton, the former Chief of Staff at the New York Times” 1860-1870, his quote on the independence of the press. “There is no such thing, at this date of the world’s history, in America, as an independent press. You know it and I know it. There is not one of you who dares to write your honest opinions, and if you did, you know beforehand that it would never appear in print. I am paid weekly for keeping my honest opinion out of the paper I am connected with. Others of you are paid similar salaries for similar things, and any of you who would be so foolish as to write honest opinions would be out on the streets looking for another job. If I allowed my honest opinions to appear in one issue of my paper, before twenty-four hours my occupation would be gone. The business of the journalists is to destroy the truth, to lie outright, to pervert, to vilify, to fawn at the feet of mammon, and to sell his country and his race for his daily bread. You know it and I know it, and what folly is this toasting an independent press? From years of extensive research, here is our list of ruling families that control the world. As Oxfam warns that global wealth inequality is spiraling out of control, we ask why the Rothschilds and Rockefellers are missing from the business magazine’s definitive annual guide…with some startling revelations. This is a House of Rothschilds maxim, widely attributed to banking tycoon Mayer Amschel Rothschild in 1838 and said to be a founding principle for the highly corrupt banking and political system we have today. Along with the Rockefellers, the Rothschild dynasty is estimated to be worth well over a trillion dollars. How are these powerful families linked to the ongoing crisis of global wealth inequality, why are so many people unaware of their existence, and why doesn’t Forbes ever mention them in their annual list of the world’s wealthiest people? Two months later, following Oxfam’s calculation and having published the new 2014 rich list, Forbes journalist Kasia Morena did some fact-checking. She found that the number of billionaires owning the same as the poorest 3.5 billion had dropped from 85 to 67: which demonstrates an enormous widening of the global inequality gap in just one year. Fast-forward to 2015, and another Oxfam investigation. The anti-poverty charity warned in January that if nothing is done to tackle global wealth inequality- by forcing corporations to pay their taxes and closing off-shore tax havens, for example- the richest 1% will own more than everybody else in the world combined by 2016. In a paper called Wealth: Having it all and wanting more, Oxfam outlined how the richest 1 percent have seen their share of global wealth increase from 44% in 2009 to 48% in 2014, and will likely surpass 50% in 2016. Winnie Byanyima again warned that the explosion in inequality is holding back the fight against global poverty at a time when one in nine people do not have enough to eat, and more than a billion people still live on less than $1.25 a day. The organization also outlined how 20 percent of billionaires around the world have interests in the financial and insurance sectors, a group that saw their cash wealth increase by 11 percent in the last 12 months. Billionaires listed as having interests in the pharmaceutical and healthcare sectors saw their collective net worth increase by 47 percent, and the industry spent more than $500 million lobbying policy makers in Washington and Brussels in 2013 alone. Here is Forbes’s (real-time) list of the 66 billionaires who (officially) own half of all global assets, and will soon own more than the rest of Earth’s seven billion population combined. They range from CEOs of large corporations to oil and gas tycoons and Silicon valley entrepreneurs. The list details name, net worth, percentage change since the 2015 results, their age, industry and nationality. Bill Gates is ranked first at $469 billion, and James Simons at #66 with the $14 billion he made from hedge funds. But where are the world’s Royal families? And more to the point, where are the Rothschilds and the Rockefellers? These two families have an unimaginable amount of wealth that surpasses the trillion mark- they are the only trillionaires in the world, and yet they are missing from Forbes’s list every single year, along with the handful of other men commonly believed to own our politicians, our media, our corporations, our scientists, and even our money supply. 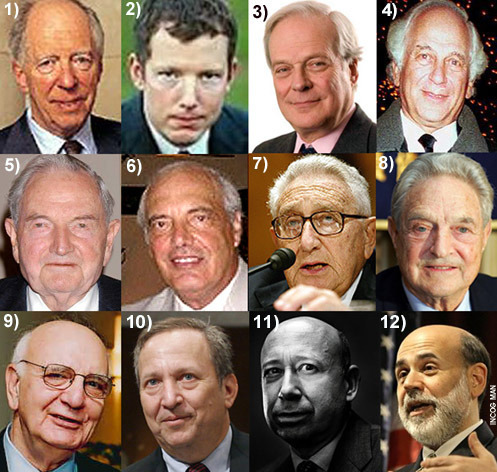 Five of the most powerful and wealthiest men in the world belong to the Rothschild and Rockefeller dynasties. Russo’s Rockefeller revelations: False flags, power grabs, and an enslaved population. Russo, a film-maker and activist who directed America: From Freedom to Fascism, claimed that Nick Rockefeller told him about ‘an event that would allow us to invade Afghanistan and Iraq’ some eleven months before 9/11, and foretold the fact that the ‘War on Terror’ would be a hoax wherein soldiers would be looking in caves for non-existent enemies (see video). In the interview, Russo claims that he first met lawyer Nick Rockefeller after being introduced by a mutual attorney friend. The two men hit it off, and later down the line Rockefeller apparently confided in Russo privately what his family had planned for the world: never-ending war, global population reduction, economic collapse, widespread chaos and disorder on such a scale that people would actually welcome the ultimate ‘solution’: a one-world government. He was speaking in October 2000, and most of his predictions have now come to pass- including 9/11 and the subsequent War on Terror. He goes on, “I used to say what the point, Nick? You have all the money in the world, you have all the power in the world, whats the end goal?” Rockefeller is said to have responded bluntly: “To get everyone chipped.” According to this theory, the families who own the banking system are bored of their wealth, it is no longer enough. To control society itself is the ultimate end-game. According to Russo, Rockefeller told him that a global government would slowly phase out paper money from circulation, with its eventual aim being to microchip the population, turning us all into slaves of the NWO. These are wild claims indeed, and from a journalistic point of view, they cannot be verified one way or the other. But it’s worth noting that just before Russo died in August 2007, he filmed a moving message to all Americans. In it, he talked about how vital it is for people to continue to resist national ID cards and microchips, and fight for their individual freedoms against those who would enslave us. It’s also worth pointing out that it’s not only activists like Russo and scare-mongering patriots like Alex Jones who have tried to ‘out’ the Rothschilds and Rockefellers. The problem is, all those who do so are silenced. This is exactly the kind of question the European public would like an answer to. Yet Mote did not receive one. Instead, the 79 year old politician was sacked from his own party, and later arrested and sent to jail for allegedly claiming false expenses during his time as an MEP. Mote claimed throughout his trial that he was ‘targeted for being anti-Europe’, and said the money he claimed was used to pay third-party whistleblowers in a quest to uncover corruption and fight for democracy and transparency in European politics. Like everything else relating to the people who really run the show, the truth is out there…but it’s almost impossible to pin down.